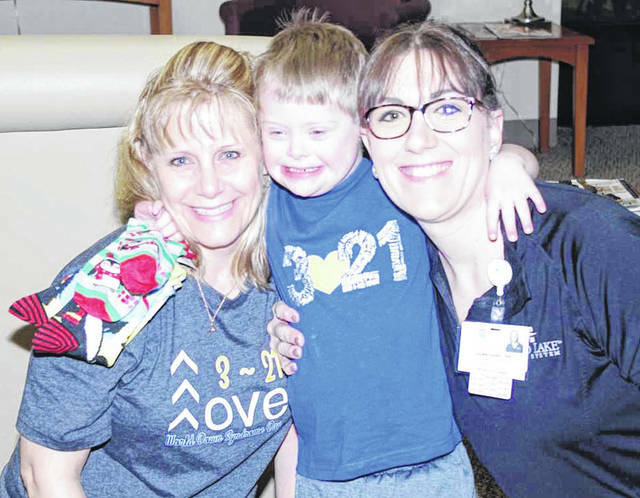 Mary Topp, left to right, Grant Topp, and Dawn Gabel, director in inpatient services show some of the socks Grant and his family and friends, donated to Joint Township District Memorial Hospital for patients and staff in honor of Down Syndrome Day. ST. MARYS — World Down Syndrome is annually observed on March 21, signifying the third copy of the 21st chromosome, which results in Down Syndrome. This day is celebrated to raise public awareness of Down Syndrome and to help spread awareness and acceptance by rocking a pair of crazy socks on this day. Grant Topp, along with his family and friends, donated socks to Joint Township District Memorial Hospital for patients and staff. Their hope is to help raise awareness of Down Syndrome and help to promote inclusion and acceptance of those who have Down Syndrome. This is their fifth year donating socks to the patients and staff of the hospital.